STMicroelectronics provides an extensive software library for the STR73x device series. The library is ported to MDK-ARM and the RealView Compiler, and is available in the folder ...\ARM\RV31\LIB\ST. The STR73x Software Library is a software collection for the STR73x peripherals. The library contains a set of functions for each peripheral. STMicroelectronics provides detailed documentation in the STR73x Software Library Users Manual. STR73x.LIB: fast and efficient interrupt function handling (Keil-Style). This is the preferred library when starting new projects. STR73xD.LIB: (Debug Version) STMicroelectronics specific interrupt handling and debug variables for peripherals. Because the Keil µVision Debugger provides detailed outputs for all on-chip peripherals, this library is not required when you are using the Keil µVision Debugger. STR73xR.LIB: (Release Version) STMicroelectronics specific interrupt handling without debug variables. The Keil RTX does not work with STMicroelectronics interrupt handling, therefore, do not use this library with the Keil RTX. If you use this library for different hardware, you may need to change the settings in the 73x_conf.h file and re-build the library using the µVision project. 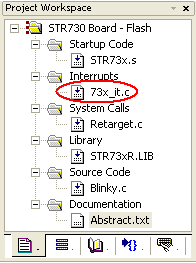 If you use any STMicroelectronics library functions, be sure to include the header file, 73x_lib.H, since it contains the definitions for the STR73x Software Library functions and macros. When using the STMicroelectronics specific interrupt handling, you need to add a copy of the source file ...\ARM\LIB\RV30\ST\STR730\Interrupts\73x_it.c. This file contains all interrupt functions.